Paw Patrol: On A Roll is a capable, kid-friendly platform game. Heroic hounds of every rescue discipline travel left to right, collecting items and using their special skills to save humans and animals in peril. It’s fun, but after a dozen missions, its endless instruction repetition and a lack of equal puppy representation frustrates even the most hyper-focused seven-year-old. My son Seamus and I, when not collecting Pokemon, have been working our way through Outright Games’ latest licensed cartoon game. Paw Patrol: On A Roll is a simple game that’s mostly perfect for its target audience of kids. 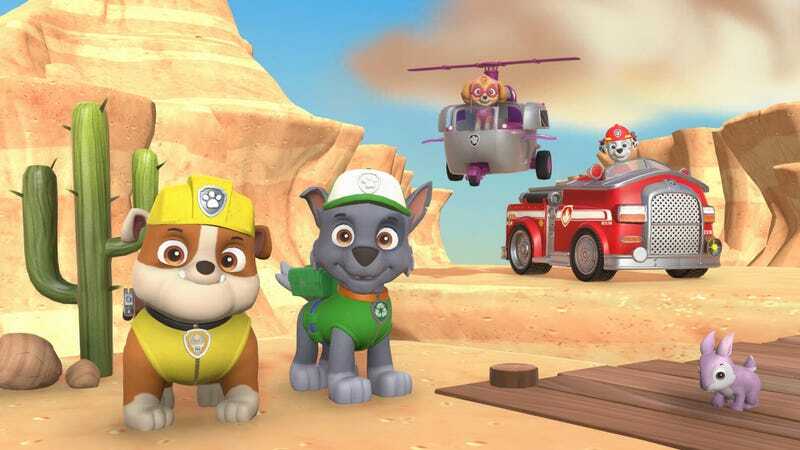 Deployed from their headquarters by their human leader Ryder, the pups of Paw Patrol undertake a series of rescue missions. Each mission features the same basic structure. Two of the eight canine characters are chosen to participate in the level, based on their particular set of skills. For example, in order to “Save Mandy the Monkey” from an erupting volcano, firefighting Dalmatian Marshall can use his water to cool hot rocks, clearing the way for Rocky the recycling mutt to craft ladders and bridges out of reclaimed wood. These mini-games are quite lovely and I wish the game had more of them. Nothing fancy, but that’s fine. It’s for kids. The main problem Seamus has with the game is human Paw Patrol leader Ryder, who never shuts up. “Stop saying that! You’ve already said that!” We’ve completed more than a dozen missions now, and Ryder feeds us instructions on how to perform simple tasks over and over again. Every time a puppy comes across a rope to pull, we get a full set of instructions. When it comes time to pick which puppy skill to use to overcome an obstacle, Ryder talks us through it. He tells us to collect all the puppy treats. Are we collecting all the puppy treats? By the way, we need to collect all the puppy treats. In case you missed it, Ryder says we should collect all the puppy treats. Every time Ryder repeats instructions, Seamus yells at him. The game has effectively turned my son into a repetitive non-player character. I mean, he was headed that way anyway, but Paw Patrol: On A Roll has certainly helped. I have tried to fix the issue. I’ve turned the dialogue volume down completely and turned off subtitles (a great option to have). This results in Ryder popping up on the screen every couple of seconds, wordlessly mouthing advice we cannot hear. I think we like it better. Now we can make up our own Ryder dialogue! The repetitive help dialogue is Seamus’ problem. My problem is more of a content issue. Look at these dogs. There are eight members of the Paw Patrol, each with their own special skills. Skye, on the far right, can fly and use logs to build bridges. Rocky, the grey pup next to Skye, is a recycling dog who can use reclaimed wood to build bridges. Rubble the bulldog is a construction pup who can build bridges. There is a lot of bridge building in this game. But redundant skills are not my issue. My issue is the last two dogs on the left—Everest the snow dog and Tracker the jungle rescue pup. In a game where each mission showcases the talents of up to four members of the Paw Patrol, these two are woefully underused. An end-of-mission scene. Note there is no Tracker or Everest, because they are useless. Part of this is the old Aquaman issue. Everest and Tracker’s skills are closely tied to their environment, like Aquaman and water. Everest needs snow, Tracker needs jungle. I can see where a snow level early in the game might not make sense. But out of the 13 missions I’ve completed, more than half have featured jungle vines, and Tracker still has yet to appear. As for Everest, after infecting my son with exclamations of “What about snow dog! ?” every time she didn’t appear in a mission briefing, Everest finally showed up in mission 13. Her snowboarding skills are put to good use, and should a plow be needed, she’s your pup. It’s about time. I won’t admit letting out a triumphant cheer as I took this screen, but I might have. Seamus and I have started mission 14, and there is still no sign of Tracker. The developers did render him, so I have hope that the bilingual Chihuahua will soon join the fray. Paw Patrol: On A Roll is a fine game for young children. It’s a little on the simple side for my tastes, but then my tastes are constantly changing the more I am exposed to father and son gaming. Seven years ago I wouldn’t have even cared whether or not Tracker made it into the game. Now I am concerned. In case you were worried, we did end up rescuing Mandy the Monkey. Paw Patrol: On A Roll is available now on Switch, Xbox One, PlayStation 4 and PC.